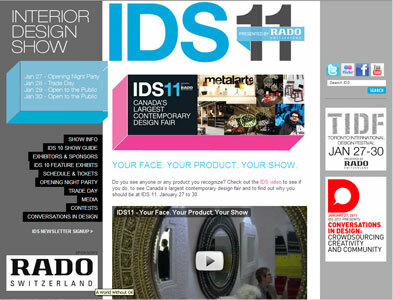 The Interior Design Show (IDS 10) is Canada's largest contemporary design show, having served over 500,000 design professionals since inception in 1998. Requiring a new look and feel for this year's event Intrigue partnered with Swerve Design to create a revamped website that allows IDS staff to keep content up-to-date, allows exhibitors to connect and login for details, and includes an integrated, seamless, third partied blog system. The project was completed on budget, on time, and has solicited rave reviews! We're very pleased with the feedback and with the opportunity to be involved.